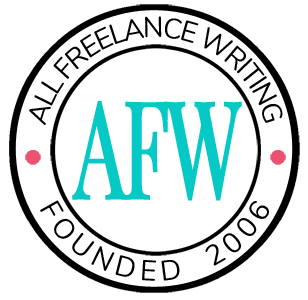 I mentioned previously that I was having a difficult time finding Scrivener templates for freelance writers. Most are focused on writing books. I already released two free templates that will help you use Scrivener for blogging -- one for managing a single blog and one for managing multiple blogs. Today I'm releasing my first template for common freelance writing projects -- a white paper template. I broke down the template by common white paper sections. Each section has it's own folder in the Binder view. 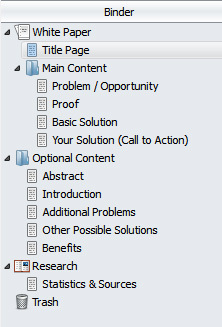 Only sections included in the "Main Content" folder are compiled into your exported white paper. In the template, these include the bare bones white paper sections. Others are included in the "Optional Content" folder (as seen below). If you decide to use any of these optional sections, simply drag the documents into the main content folder and place them where you'd like them to appear in the current document order. You can remove sections from your white paper, or re-order them, in the same way. Drag them to their appropriate position or drag them into the optional content folder if you don't want to use them. There is also a simple Title page example, and a Statistics & Sources page in the Research section. This is where you can quickly list any interesting statistics you find during your research (along with their sources), making it easy to sort through them later to pick the best supporting information when drafting your white paper. This template should work for both Mac and Windows versions of scrivener. This, you are so very nice, generous, to offer these templates. Truly appreciate them, I do. I was so excited to find this. I’m hoping to break into writing White Papers as a side hustle, and having an outline (in Scrivener no less!) will be extremely helpful! Thank you! I hope it helps Becky! I’ll warn you up front, I haven’t tested on Scrivener 3 yet as I don’t use the Mac version. So I can’t promise it’ll work there. Just make sure you import the template (don’t try to open it in Scrivener like a project file). That’s the biggest problem folks have had in the past.